As an organization and employer, it is your job to make sure you are in compliance with government requirements. Smart ERP Solutions (SmartERP), a leading provider of Enterprise Business Applications solutions and services, will host the Department of Homeland Security (DHS) - United States Citizenship and Immigration Services (USCIS), for a complimentary educational webinar with DHS analyst David Basham. Basham will be presenting: "What’s New with Form I-9 and E-Verify in 2018," covering updated requirements for Form I-9 and its companion E-Verify. This live interactive one-hour event is open to all U.S. employers and will take place on Thursday, February 15 at 10:00 AM (PST)/1:00PM (EST). Registration for this complimentary webinar can be accessed here. Understanding the complexities of Form I-9 requirements can be difficult, and non-compliance can be detrimental to any organization, as witnessed by many employers across the U.S. that have received substantial fines and penalties due to their lack of compliance. Form I-9 fines have recently increased, and the Department of Justice has recently settled with several employers over discriminatory conduct, making it more imperative than ever for employers to ensure that they are meeting compliance requirements for the new Form I-9. Commissioned by the U.S. federal government in 1997 (under the name Basic Pilot Program), E-Verify was developed as an advanced means of discouraging undocumented immigration. This is accomplished through a quick comparison of each applicant's Employment Eligibility Verification Form I-9, with the data stored in government records. Attendees of the webinar will be provided with a unique opportunity to engage directly with Dave Basham, a Form I-9 and E-Verify SME that works in the very government division, within USCIS, that houses both programs. The webinar will provide you with valuable insights, such as information on avoiding discrimination during the hiring process, foreign nationals and completing the I-9, and how to accurately correct a Form I-9. 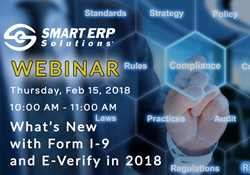 In addition, the webinar will touch upon determining how your organization can use E-Verify, and why it is important that you understand how your organization processes its employees’ Forms I-9. To register for this webinar click here. Mr. Basham joined the U.S. Citizenship and Immigration Services in 2008 following his retirement from the U.S. Army. He has conducted over 500 Form I-9 and E-Verify presentations to nationwide audiences including elected officials, immigration attorneys, compliance personnel to human resources and payroll professionals. Dave conducts ongoing sessions for many associations that include; Society of HR Management (SHRM), American Payroll, and National Notary. In 2016, the American Payroll Association presented Dave with their annual Government Partner Award in recognition of his service, as a government agent, to the payroll community. Learning how to prevent discrimination and avoid unlawful conduct during the I-9 process. Understanding the rules for completing the I-9 for foreign nationals, and how to handle expiring work authorizations and reverification. Acquiring information on how to properly correct Form I-9 mistakes and missing forms. Understanding the Form I-9 storage and retention policy. Discovering solutions and resources to aid employers in complying with government regulations. Understanding some important differences between Form I-9 and E-Verify requirements. Smart ERP Solutions®, Inc. is a unique organization in the Enterprise Business Applications space providing innovative, cost-effective, and configurable on premise and cloud solutions and services that efficiently extend the capabilities of ERP systems to meet specific business process needs. The organization’s Smart I-9/E-Verify and Employee Onboarding solutions integrate with popular HR systems to automate the employment eligibility verification process. Smart ERP Solutions enables clients to seamlessly integrate their people, processes, applications, and data, across an enterprise, enabling the organization to streamline its operations and support business growth. The United States Department of Homeland Security is a cabinet department of the United States federal government with responsibilities in public security, roughly comparable to the interior or home ministries of other countries. USCIS secures America’s promise as a nation of immigrants by providing accurate and useful information to their customers, granting immigration and citizenship benefits, promoting an awareness and understanding of citizenship, and ensuring the integrity of their immigration system.